Today Craig and H and I went to look at a motor home. It is a 1984 model – fancy is not a term you would be likely to choose to describe it. We have decided it is perfect for us… and will take care of the final details tomorrow… and then the beast will be ours. H was immediately smitten with it because it looks like the one in Walking Dead… I have to agree; that puts it way, way up on the cool factor. So we have been pondering names… We like to name things in this house. We considered Merle – you know – the bad guy from Walking Dead. Ya – that was pretty funny. Then we considered Merlin, Slave 1 (Jango Fett’s ship), Enterprise, Eagle 5 (The interstellar motor home from Spaceballs), and The Millenium Falcon. 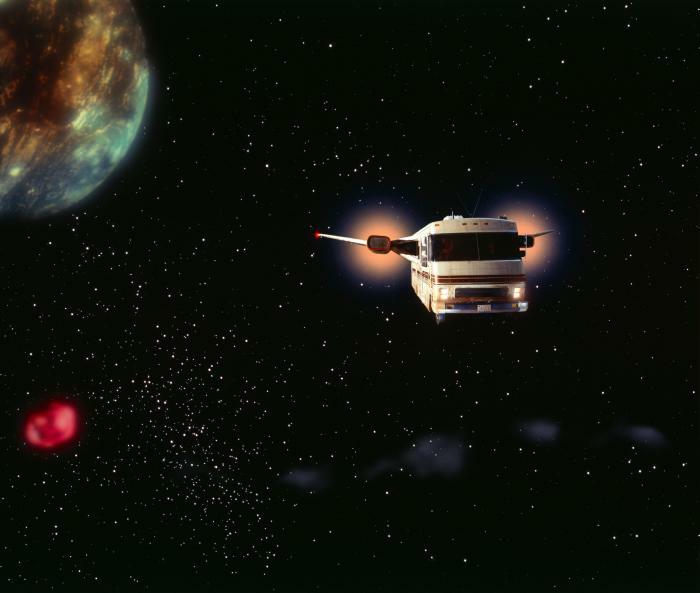 SPACEBALLS, Space Winnebago, 1987. (c) MGM. I still like Merle – or maybe Orwell, playing on the 1984 reference… but we are going to let H decide. Who am I fooling?? I already know H is going to choose Millenium Falcon. In all honesty, I am certain he is already calculating out how to make it look like there is a bubble-dome-gun-turret-type-thing on the roof… or maybe even better… an R2D2 dome like the van in Fan Boys. Hmmm… a melamine bowl and some carefully applied acrylic …and well – of course – duct tape – and I think we’d be in business! It isn’t beautiful – this motor home – not by any measure of the word… but it will be ours. And it will be an investment in spending time together… in family… in hanging out in the woods… and, I suspect, in solidifying and possibly even advertizing our geeky nerd pride! This entry was posted in Autism, retro pop culture, Star Trek, Star Wars and tagged 1984, Camping, Family time, Merle, Millenium Falcon, Motor home, Naming things, R2D2, Spaceballs, Star Wars, Walking Dead. Bookmark the permalink. Ah – Yes!! Craig has agreed to drive! Yay!! ooh ah! can’t wait to see it!